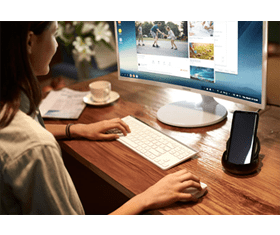 Samsung DeX is a new user experience that extends the functionality of your Android device to a PC-like environment. Simply connect your Samsung DeX compatible device to an HDMI monitor with the Samsung DeX Station, DeX Pad or HDMI adaptor and it automatically launches. This guide explains some of the ways to optimize Android apps to work in Samsung DeX, but by default most of Android applications are compatible with Samsung DeX. Why build a Samsung DeX compatible app? Reports show that 74% of IT workers use two or more devices for work, 52% used three or more. This increasing fragmentation causes lost productivity. Samsung solves this problem with Samsung DeX and brings the PC-like experience to Android. Samsung DeX compatible apps utilize the powerful features offered in Samsung DeX Mode. This robust, multi-tasking environment encourages users – and provides them with the technical capacity – to adopt Android as a primary ecosystem for any task: word-processing, photo-editing, games and more. Apps that are not modified to be compatible with Samsung DeX can still be launched, but operate in a fixed-size window with limited functionality. Apps in Samsung DeX take advantage of Android N's new Multi-Window features. Users can open multiple apps in the same session to work, connect and interact seamlessly together. Apps launched in DeX mode can be expanded into a full screen, immersive window. Showcase the full features of an app without the expense of screen real-estate. Samsung DeX compatible apps add powerful features to the mobile experience. Drag and drop files between windows, copy and paste between multiple apps, ALT+ TAB, and more. Q01 What SDK does my app need to target to run in Samsung DeX? Ideally, you should be targeting SDK 24 and above. Apps targeting version 23 and below can still run in Desktop Mode, however, some features may not work correctly. Q02 What are the minimum requirements my app must meet to open in Samsung DeX? Unless apps declare that multi-touch or touchscreen are required, they will run in Samsung DeX. 1. Support Multi Density for xxxhdpi (640 dpi) and mdpi (160 dpi). 2. Support Mouse or trackpad interaction. 3. Support Android N Multi-Window and explicitly declare android:resizableActivity=”true” in the Manifest. For more information, see Modifying your app in the DeX developer guide. Q03 Why doesn’t Multi-Window work, even though android:resizeableActivity="true" has been declared in the Manifest? Q04 Why can’t my app be re-sized in Samsung DeX like other apps? 1. Desktop mode: Apps that comply with Android N Multi-Window Standards. They operate in Free-Form Multi-Window Mode and can be re-sized accordingly. 2. Fixed-size Window Mode: Apps that do not comply with Android N Multi-Window standards. They operate only in a fixed mobile dimension and cannot be re-sized. Q05 My Bluetooth mouse and keyboard are not working in Samsung DeX, why? Q06 What is the reason for the following notification: "Some functions of this app may not be supported in Samsung DeX”? For more information on implementing Multi-Window, see Android's Multi-Window reference guide. Q07 Some of my app resources are not being displayed correctly in Samsung DeX. For example, some menu icons are overlapping each other. These layout issues may occur if you have not modified your code appropriately to handle the density display changes required to run apps in Samsung DeX. For example, you may need to provision separate images in both xxhdpi & mdpi for your app in order for it to display properly. Q08 My app does not always change to the proper resolution correctly when switching between Mobile and Samsung DeX Mode. What might the problem be? This can occur if your app custom UI framework does not handle the density change from xxhdpi to mdpi properly. Try checking the onConfigurationChanged() method. Sometimes the .newConfig parameter can hold the old density value. For instance, when switching from DeX Mode to Mobile Mode, the density value in the newConfig parameter sometimes still reports 160 dpi. For more information on density changes, see Androids guide on run time changes.Androids guide on run time changes. Q09 My app sometimes displays the wrong density UI resources when switching from Mobile and Samsung DeX mode. This can occur if the resources for the activity – fetched using Activity.getResources()– are not changed when switching from Samsung DeX mode to Mobile mode. To avoid this problem, ensure that resources do not remain persistent from the same application session. Q10 Do I need to install any special apps or use any APIs to enable Samsung DeX? No. Samsung DeX is preloaded in Galaxy S8, S8+, S9, S9+, and Note 8 devices. Q11 An error occurred while using Samsung DeX, what should I do? Please report errors that occur while using Samsung DeX. By letting us know the issues that need to be fixed, you are directly contributing to how our service improves with future updates. 1. While using Samsung DeX, open Settings. 2. Select the button with three vertical dots (︙More) on the upper right corner. 4. Describe the error you encountered then select the "send system log data" check box. Note - Error reports contain log data and may include some personal information. Reported information is used only to analyze the issues reported. In this 1-hour webinar we will guide you through making your Android app optimized for Samsung DeX as well as the process for building and testing a Samsung DeX compatible app. Samsung DeX extends the functionality of a mobile device to the desktop environment. 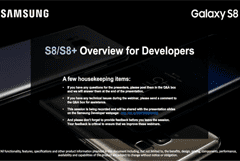 Developers will learn how to optimize their Android apps for the next generation of Samsung devices with enhanced services, desktop-mode capabilities, and an overall improved in-app experience. Developers will also learn how to leverage Samsung Knox to add security features to their Samsung DeX apps. Smartphones have changed our lives forever, and we strive to push mobile technology beyond just your device screen. Samsung DeX brings a desktop experience to your Android apps. Join us, along with a panel of industry guests, to discuss how DeX can change user experience and answer questions like: What makes a PC a PC? How relevant is the desktop experience in an increasingly mobile world? Samsung DeX has enabled users to work more efficiently on their mobile device by converting it into a light PC. In addition to sharing updates on how to optimize apps on the latest DeX, this session will include a demo of how Linux on DeX works for developers.